If you watch the news lately, I’m sure you’ve seen all of the candidates doing their best to win your vote. I was teaching first grade during the last presidential election. At this age, you wouldn’t expect students to pay much attention to the election process. With this class, you would be very wrong! It didn’t matter what my lesson was about, one of my students could somehow make a connection to the lesson and the election. I was being observed and teaching a lesson about winter when Sure enough, one of my future politician popped up and said that Sarah Palin lives where it’s winter all the time. Then another one said she hoped Sarah lost the election. Republicans are better! No, democrats are better! The debate was on! UGH! Thankfully, my principal took it all in stride. With all of this interest, I knew I had to do something . . . something that wouldn’t create more controversy, yet tapped into my students’ interest in the election process. All these budding politician and future journalists wanted answers so I created my own class mascot election. We had Ms. Frog of the Pond Party and Mr. Monkey of the Jungle Party competing in our election. Our class was divided into two campaign groups complete with a campaign manager, press secretary, and all the other jobs that go along with a quality run campaign. we even had theme songs. The Pond Party chose “Who let the frogs out” as their song of choice and the Jungle Party chose “The Monkees”. Other classes in our school were our constituents. Each group, with some adult help, designed a campaign powerpoint presentation along with advertisements (posters) that was shown to the constituents before they voted. I found out later that a few of my more ambitious students were campaigning door to door for their candidate. This would not have been possible with out the help of some amazing mothers. By the end of this experience my students had a better understanding of an election and had fun in the process. 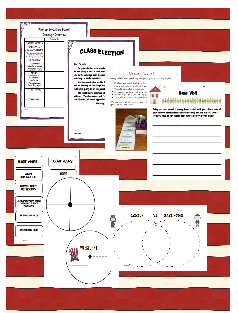 To help your students understand the election process, hold an election for a class mascot. The winning mascot will go home with his constituents to visit. You may either use a traditional stuffed animal or Webkinz so the mascot’s visit will have a tech connection.This packet includes a generic forms so you can tailor the election to fit your class. I also included the animal and political parties that I used with my class. -Investigations: Use a computer or other resources to investigate the following about your assigned president: early, years, work experience, presidency, important events, and interesting facts. I’ve joined an election day linky party. Click below to find more great ideas.